Due to the depreciation of Rejuvenate by Yifan Lu, gui4Rejuvenate will no longer be maintained. It will not receive any future updates. gui4Rejuvenate is a user-friendly graphical front end for Yifan Lu's Rejuvenate. It is simply a graphical front end, and requires Rejuvenate. It is meant to be dropped into your Rejuvenate directory, but you may set a path to your Rejuvenate installation in the settings. It's simple to use. Just select the homebrew elf from the list box and click "Run Homebrew". Start PSM Dev or PSM Unity on your Vita (depending on mode, it defaults to PSM Dev on first run) and your homebrew will run on your Vita. Should run on Windows XP up. Windows XP users will require .Net Framework 4 to be installed, but if you are running Rejuvenate, it should already be installed. Fixed a bug that may make PSM Unity mode not work. Last edited by sega dude on Sat Jul 30, 2016 5:56 pm, edited 6 times in total. This is a great idea, keep on the work! 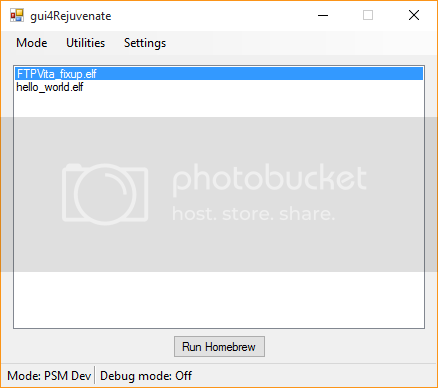 Such a program could drastically influence the future of PSVita Homebrew! It would be nice to be able to config the directory for your homebrews. Thanks for the kind words awes and SMOKE. I really appreciate it. I was going to do this originally, but it didn't work. It made VitaDefiler crash. Thinking about it now, I think I may know why. I'll look into it tomorrow and try to implement this feature in the next version. My homebrews are listed fine but as soon as i click one, I always get the VitaDefilerUnity.exe not found error. It is there and it works fine via the batch file. I also chose the Unity Mode. reprep wrote: My homebrews are listed fine but as soon as i click one, I always get the VitaDefilerUnity.exe not found error. It is there and it works fine via the batch file. I also chose the Unity Mode. Hmm, I'm not sure why that is, it worked find during my testing. Did you put gui4Rejuvenate .exe in your Rejuvenate directory? Or did you put gui4Rejuvenate .exe somewhere else and set a custom path to your Rejuvenate directory? There is a file that is exactly named "VitaDefilerUnity.exe" in your Rejuvenate directory? Edit: I figured out the issue. It was my mistake. I'll fix this bug and release a new version ASAP. Edit 2: The fixed version is now available. Get it from the same download link in the original post. @sega dude: Works great now, thanks a lot. Is this really easier than dragging a file into run_homebrew.bat? I was originally going to include a GUI but I thought the BAT script was simpler. yifanlu wrote: Is this really easier than dragging a file into run_homebrew.bat? I was originally going to include a GUI but I thought the BAT script was simpler. I can't talk for everyone, but yeah it is simpler for me. Getting all my .elf/.velf files listed and clicking on them is easier.